I simply cannot resist an apocalypse story. Especially one grounded in real life, rather than fantasy / horror tropes. So Breakdown was a must! It’s very different from the usual premise. A virus wipes out a critical portion of the world’s population, meaning that the survivors have to painstakingly reconstruct society (oh, how I loved the 70s TV series, Survivors!). But Hanna’s tale takes a slightly offbeat perspective. Former rock star Chris is in America with his wife and child when the plague starts, and it takes him years to get back to England to see if his family have survived. Terrified that he will discover that they perished, he postpones the last lap of his journey, instead falling in with a family in Portsmouth, helping to run their smallholding. Chris is traumatised by his experiences, but through his new found friend Pauline, who was a therapist before the plague hit, he starts to process his memories and feelings and begin to feel like a human being again. But is their relationship just one of therapist and patient? And when it comes to the crunch, who will Chris choose? Breakdown is a love story, albeit one in an extreme situation. What I enjoyed was that Hanna told the tale from Chris’s point of view in retrospect; we learn of the terrible things that he has endured, but we don’t experience them directly, so the horror of the situation remains containable. The breakdown of society is mirrored by Chris’s personal breakdown, and the novel charts the reconstruction of both community and self. For readers who enjoy psychology, this is fascinating, although it may disappoint those who want a brutal, survivalist narrative. Ultimately this story is about normal people, and the healing power of relationships, rather than dystopian gloom; I found that I cared about Chris and Pauline, and the final section where their happiness is thrown into doubt was very tense for me. It made me think about what really matters in life, and how the choices we make at every stage of our own journey impact on others. 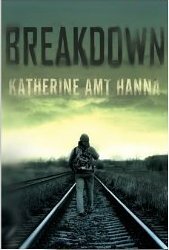 Breakdown is a thoughtful, poignant novel, and an intriguing one to add to my collection of apocalypse narratives. 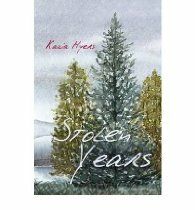 It sometimes seems that the trend for paranormal romance will never reach its end… In fact it’s quite easy to get cynical about the narrow range of fiction pushed at a young adult audience. So I was surprised that I enjoyed this new offering to the genre, and now feel that perhaps there’s life in it yet!